A perfectly rustic guest book for a lovely country couple! 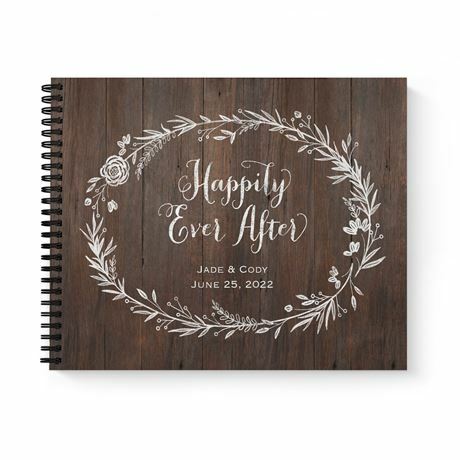 The Ever After Wedding Guest Book is a charming combination of natural wood grain and elegant greenery in white. You get to personalize the front and back covers. The inside is filled with 60 white pages lined front and back. This Guest Book could be used for a Wedding Ceremony, Wedding Reception, or even for your Bridal Shower! 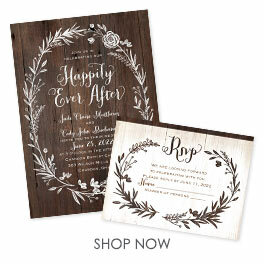 Live Happily Ever After! Personalization Options: Design is printed as shown on front and back covers. Your wording is printed in white only in your choice of fonts.